AUSTIN, Texas (Hypergiant PR) — Hypergiant Industries today announced the launch of its Hypergiant Galactic Systems division, with the goal of helping mankind expand its horizon into the next frontier through orbital AI. Hypergiant Galactic Systems will focus on artificial intelligence-driven aerospace and astronautic software and hardware products for the booming space industry. 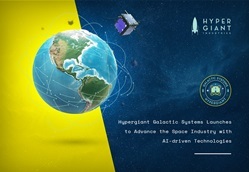 In its first step towards realizing this vision, Hypergiant Galactic Systems has acquired Satellite & Extraterrestrial Operations & Procedures (S.E.O.P.s), a Houston-based satellite deployment and services provider that offers innovative proprietary launch and deployment systems servicing the CubeSat and MicroSat markets. S.E.O.P.s is led by CEO Chad Brinkley and CTO Michael Johnson. A space entrepreneur with nearly 20 years of experience in the Aerospace & Defense market, Brinkley’s expertise spans the government, military, and commercial sectors. On the technical side, Johnson is the industry leader in designing space research platforms, habitats, modules, launch systems, and spacecraft. He was previously the co-founder of NanoRacks, the first commercial space company to launch CubeSats using the International Space Station (ISS). To date, over 210 CubeSats have been deployed, fueling the rise of commercial space investments. Both Brinkley and Johnson will continue to lead as CEO and CTO of Hypergiant S.E.O.P.s, a subsidiary of Hypergiant Galactic Systems. S.E.O.P.s became a leader over the last decade in the industry by flying satellites and payloads to low Earth orbit (LEO), utilizing deployment off the International Space Station (ISS), as well as using ISS visiting vehicles. The S.E.O.P.s Slingshot CubeSat launch system was designed to exploit the unused Cygnus vestibule volume of the passive common berthing mechanism (PCBM) by deploying sideways using a zero tip-off mechanism. SlingShot Deployers accommodate any customer’s CubeSat formats and configurations. The system can also fly hosted payloads utilizing the core spacecraft for data, power, pointing, and communications. No other system provides comparable space agility. By working with Northrop Grumman, CASIS, and the U.S. National Laboratory, S.E.O.P.s is executing on the vision of the commercialization of space for industries spanning defense, energy, security, and more. S.E.O.P.s’ proprietary sideways deployment also makes it possible to mount SlingShot deployers on a geosynchronous satellite bus such as a Boeing 702 or Lockheed 2100, opening small satellite deployment in the GEO belt. Furthermore, S.E.O.P.s has been testing its MicroSat solution (MACE), which is planned to come online in 2019 to deploy larger spacecraft. Hypergiant Galactic Systems is a subsidiary of Hypergiant Industries, the first machine intelligence industrial complex, recently co-founded in Texas by Ben Lamm. Leveraging emerging technology in AI, space transport, and imaging techniques, Hypergiant Galactic Systems is completing the vision of a universe intelligently powered. “Artificial Intelligence has the potential to make virtually every machine more efficient. The same is especially true of spacecraft and all the ground systems required to support them. We wish Hypergiant Galactic Systems and S.E.O.P.s the very best as they help us accelerate space exploration beyond what was possible even a decade ago.” said Bill Nye, CEO of the Planetary Society. Hypergiant Galactic Systems will be based in Houston, Texas with a field office in Washington D.C.
Hypergiant Galactic Systems is a revolutionary orbital systems and constellations enterprise that combines artificial intelligence with proprietary hardware and the latest advancements in space access. Focused on evolving international commerce with more accessible and affordable space missions, Hypergiant Galactic Systems identifies, invests in, and acquires celestial technologies that can be integrated with and enhanced by machine intelligence. Currently, Hypergiant Galactic Systems operates Hypergiant S.E.O.P.s, a satellite launch and deployment company utilizing International Space Station infrastructure to service the CubeSat and MicroSat markets through its proprietary launch hardware and software. Hypergiant Galactic Systems is owned and operated by Hypergiant Industries.